The annual freeze-up in Arctic waters off Alaska is coming later, and some beluga whales seem to have taken notice. A new study found that Chukchi Sea belugas are starting their autumn southward migration up to a month later than they did in the early 1990s. The study, led by University of Washington scientists and published in the journal Global Change Biology, is the first that examines the way Pacific Arctic belugas are changing their migration patterns as their habitat warms and ice retreats. The migration study parallels another study, also published in Global Change Biology, that shows how the open-water period in the Chukchi Sea has expanded by 80 days since 1979. Most of that expansion, tracked since satellite records began, is from delayed freeze-up rather than earlier melt, says the study, by scientists at the National Snow and Ice Data Center and the University of Washington. Averaged over the 1979-2014 time period studied, the analysis found that ice retreat occurred at a rate of 0.7 days earlier each year and advance occurred at a rate of 1.5 days later each year. For belugas, which can live for more than 50 years and reproduce slowly, such changes in habitat have big implications, even at the individual level. 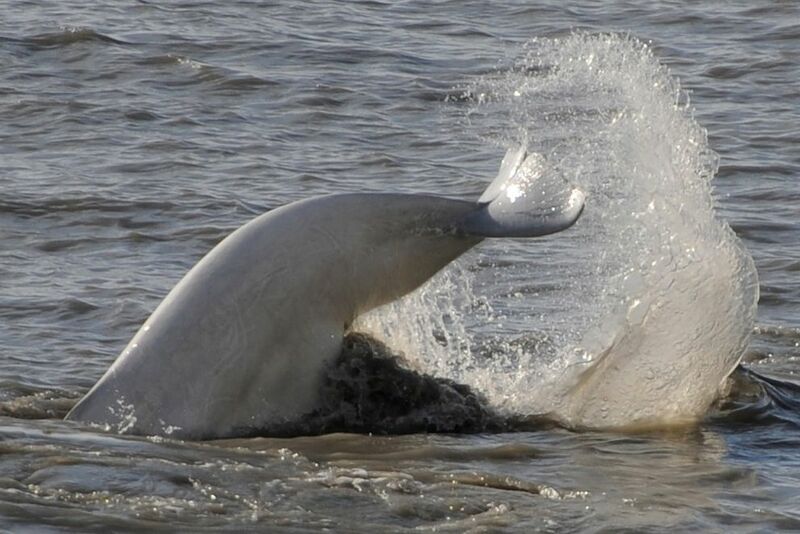 Their long lives "can make them particularly susceptible to broad-scale, sudden, and unidirectional changes," the beluga study says. To discern migration patterns, the scientists used signals from tagged whales that were tracked between the early 1990s and 2012. In all, 65 whales were tagged over that period, with tags attached by nylon pins to their dorsal ridges. Aside from the changes to Chukchi belugas' migration, there was another important finding: The larger Beaufort Sea beluga population, made up of animals that are genetically distinct from the Chukchi population, has not changed its fall migration, despite ice changes. This difference fits a pattern among beluga populations across the Arctic that are showing varying migration patterns, said Donna Hauser of the University of Washington's Polar Science Center and the study's lead author. "It suggests that belugas can respond in a flexible way to changing climate conditions, but not all populations will respond in the same way," she said. It also fits with another pattern that extends to other Arctic species, Hauser said. She cited the case of polar bears, which are struggling with population declines and poor body conditions in their southern Beaufort Sea population but are more robust in their Chukchi Sea population. "This is actually something that's coming up over and over again for Arctic predators," she said. Much about the Chukchi and Beaufort beluga populations remains mysterious, Hauser said, and some of the behavior might seem confusing. In September, before they migrate south into their Bering Sea wintering grounds, the Chukchi and Beaufort populations switch places. The Chukchi belugas move to the Beaufort whales' summering territory off the Mackenzie River Delta and the Beaufort whales shift over to the Chukchi. Just what they do in winter in the Bering Sea is not yet clear. There are indications that the different population groups keep to their own territories, as described in one recent study by researchers from the Alaska Department of Fish and Game and other organizations. Conditions that favor delayed Chukchi freeze-up are already setting up this winter. A major factor in the timing of refreeze, the authors found, was the inflow through the Bering Strait of relatively warm water from the Bering Sea to the Chukchi. Two-thirds of the variance for ice-advance dates was related to late-summer Bering Strait water inflow, the scientists found. This year, the Bering Sea continues to be warmer than normal, signaling that yet more ocean heat has passed through the Bering Strait, said Mark Serreze, director of the National Snow and Ice Data Center and the lead author on the Chukchi ice paper. Led by scarcity in the Bering Sea and in Europe's Barents Sea, ice extent has been particularly low this winter — and temperatures in the Arctic were high through the early part of the season, Serreze said. "If you look at what we've seen through October, November and December, we've been basically at pretty much record lows throughout that whole period," he said. "If you have open water in December where you shouldn't have open water, it's going to make the air a lot warmer." Absence of sea ice creates its own warming momentum, and inflow of warmth in the atmosphere and in waters coming up through the Bering Strait adds to the self-perpetuating cycle, he said.